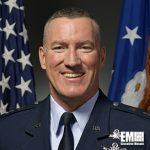 Maj. Gen. Burke “Ed” Wilson serves as the deputy principal cyber adviser to the secretary of defense at the Office of the Under Secretary of Defense for Policy within the Defense Department where he helps oversee DoD’s cyber activities, capacities and policies. Wilson also serves as a senior military adviser for cyber and offers senior military perspective on various cyber-related strategies, plans and policies that guide the Pentagon’s activities in the cyberspace. Prior to his stint at the Office of the Under Secretary of Defense for Policy, he held various leadership roles with the U.S. Air Force, Air Forces Cyber, 45th Space Wing, Space Development and Test Wing, Space Operations Group, Air Force Space Command, North American Aerospace Defense Command and the U.S. Space Command. He holds a bachelor’s degree in electrical engineering from the U.S. Air Force Academy and a master’s degree in electrical and computer engineering from Northeastern university. Wilson has also received various awards and decorations such as the distinguished service medal, defense superior service medal, legion of merit, defense meritorious service medal, meritorious service medal and the joint service commendation medal.